Roll up the fish fillets starting at the tapered end, skinned-side outwards. Arrange snugly in a gratin or shallow baking dish. Pour the cider over the top and season with salt and pepper. Cover with foil and bake for 30 minutes until firm and just cooked. Meanwhile, bring a large pan of salted water to the boil, add the baby leaf greens and boil for 5 minutes. Strain into a sieve pressing out as much liquid as possible, then coarsely chop on a board. 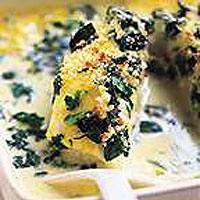 Melt the butter in a frying pan add the greens, season and gently cook for 1-2 minutes, until coated in the butter. Keep warm. When the fish is ready, strain the cooking liquid into a small pan. Cover the fish with foil to keep it warm. Add the cream to the liquid in the pan and simmer fiercely for several minutes until it thickens slightly, then taste for seasoning. Remove from the heat and whisk a small amount of the sauce into the egg yolks. Return this mixture to the sauce, and cook for 1-2 minutes until the sauce thickens a little. Preheat the grill to medium. Scatter the warm baby leaf greens over.the fish fillets and pour the sauce over the top, straining it through a sieve. Dust with the breadcrumbs and place under the grill until golden and bubbling. Serve with the butternut squash purée. Steam the flesh of 1.5kg peeled and diced squash for 20 minutes or until tender. Press through a sieve or mouli-grater, stir in 25g unsalted butter and season generously with sea salt and ground black pepper.